Definition at line 137 of file tls_cbc.h. Definition at line 142 of file tls_cbc.h. Definition at line 72 of file tls_cbc.h. Referenced by Botan::TLS::TLS_CBC_HMAC_AEAD_Encryption::finish(), and Botan::TLS::TLS_CBC_HMAC_AEAD_Encryption::set_associated_data(). Definition at line 120 of file tls_cbc.cpp. Most AEADs require the key to be set prior to setting the AD A few allow the AD to be set even before the cipher is keyed. Such ciphers would return false from this function. Reimplemented in Botan::ChaCha20Poly1305_Mode, and Botan::CCM_Mode. Definition at line 68 of file aead.h. true iff this mode provides authentication as well as confidentiality. Definition at line 47 of file aead.h. Definition at line 59 of file tls_cbc.h. Referenced by Botan::TLS::check_tls_cbc_padding(), Botan::TLS::TLS_CBC_HMAC_AEAD_Encryption::finish(), finish(), Botan::TLS::TLS_CBC_HMAC_AEAD_Encryption::output_length(), output_length(), Botan::TLS::TLS_CBC_HMAC_AEAD_Encryption::set_associated_data(), and Botan::TLS::TLS_CBC_HMAC_AEAD_Mode::valid_nonce_length(). Definition at line 63 of file tls_cbc.h. Referenced by Botan::TLS::check_tls_cbc_padding(), Botan::TLS::TLS_CBC_HMAC_AEAD_Mode::clear(), Botan::TLS::TLS_CBC_HMAC_AEAD_Mode::key_spec(), and Botan::TLS::TLS_CBC_HMAC_AEAD_Encryption::set_associated_data(). Definition at line 71 of file tls_cbc.h. Referenced by Botan::TLS::check_tls_cbc_padding(), Botan::TLS::TLS_CBC_HMAC_AEAD_Encryption::finish(), finish(), Botan::TLS::TLS_CBC_HMAC_AEAD_Mode::reset(), and Botan::TLS::TLS_CBC_HMAC_AEAD_Encryption::set_associated_data(). Definition at line 56 of file tls_cbc.h. Definition at line 52 of file tls_cbc.cpp. References Botan::TLS::TLS_CBC_HMAC_AEAD_Mode::cbc(), Botan::SymmetricAlgorithm::clear(), Botan::TLS::TLS_CBC_HMAC_AEAD_Mode::mac(), and Botan::TLS::TLS_CBC_HMAC_AEAD_Mode::reset(). Definition at line 52 of file aead.cpp. References Botan::SCAN_Name::algo_name(), Botan::SCAN_Name::arg(), Botan::SCAN_Name::arg_as_integer(), Botan::SCAN_Name::arg_count(), Botan::BlockCipher::create(), Botan::ENCRYPTION, Botan::parse_algorithm_name(), Botan::Cipher_Mode::provider(), and Botan::split_on(). Referenced by Botan::Cipher_Mode::create(), Botan::AEAD_Mode::create_or_throw(), and Botan::get_aead(). Definition at line 42 of file aead.cpp. Referenced by Botan::TLS::Connection_Cipher_State::Connection_Cipher_State(), Botan::TLS::Session::decrypt(), Botan::TLS::Session::encrypt(), Botan::mceies_decrypt(), and Botan::mceies_encrypt(). Definition at line 41 of file tls_cbc.h. Complete processing of a message. Definition at line 350 of file tls_cbc.cpp. References Botan::TLS::TLS_CBC_HMAC_AEAD_Mode::assoc_data_with_len(), Botan::TLS::Alert::BAD_RECORD_MAC, Botan::TLS::TLS_CBC_HMAC_AEAD_Mode::block_size(), BOTAN_ASSERT_NOMSG, Botan::TLS::TLS_CBC_HMAC_AEAD_Mode::cbc_state(), Botan::TLS::check_tls_cbc_padding(), Botan::constant_time_compare(), Botan::CT::Mask< T >::expand(), Botan::Buffered_Computation::final(), Botan::CT::Mask< T >::is_lte(), Botan::TLS::TLS_CBC_HMAC_AEAD_Mode::iv_size(), Botan::TLS::TLS_CBC_HMAC_AEAD_Mode::mac(), Botan::TLS::TLS_CBC_HMAC_AEAD_Mode::msg(), Botan::CT::poison(), Botan::TLS::TLS_CBC_HMAC_AEAD_Mode::tag_size(), Botan::CT::unpoison(), Botan::Buffered_Computation::update(), Botan::Cipher_Mode::update(), and Botan::TLS::TLS_CBC_HMAC_AEAD_Mode::use_encrypt_then_mac(). 417 This mask is zero if there is not enough room in the packet to get a valid MAC. 435 then to the timing channel in the MAC computation described in the Lucky 13 paper. Definition at line 58 of file tls_cbc.h. Referenced by Botan::TLS::TLS_CBC_HMAC_AEAD_Encryption::finish(), finish(), Botan::TLS::TLS_CBC_HMAC_AEAD_Encryption::set_associated_data(), and Botan::TLS::TLS_CBC_HMAC_AEAD_Mode::valid_nonce_length(). Definition at line 83 of file tls_cbc.cpp. References Botan::TLS::TLS_CBC_HMAC_AEAD_Mode::cbc(), Botan::TLS::TLS_CBC_HMAC_AEAD_Mode::mac(), Botan::TLS::TLS_CBC_HMAC_AEAD_Mode::name(), Botan::SymmetricAlgorithm::set_key(), and Botan::TLS::TLS_CBC_HMAC_AEAD_Mode::valid_nonce_length(). Definition at line 65 of file tls_cbc.h. Referenced by Botan::TLS::TLS_CBC_HMAC_AEAD_Mode::clear(), Botan::TLS::TLS_CBC_HMAC_AEAD_Encryption::finish(), finish(), Botan::TLS::TLS_CBC_HMAC_AEAD_Mode::key_spec(), and output_length(). Definition at line 57 of file tls_cbc.h. required minimium size to finalize() - may be any length larger than this. Definition at line 159 of file tls_cbc.h. Definition at line 73 of file tls_cbc.h. Referenced by Botan::TLS::TLS_CBC_HMAC_AEAD_Encryption::finish(), and finish(). Definition at line 66 of file tls_cbc.cpp. Referenced by Botan::TLS::TLS_CBC_HMAC_AEAD_Mode::key_spec(), and output_length(). Returns the size of the output if this transform is used to process a message with input_length bytes. In most cases the answer is precise. If it is not possible to precise (namely for CBC decryption) instead a lower bound is returned. Definition at line 263 of file tls_cbc.cpp. References Botan::TLS::TLS_CBC_HMAC_AEAD_Mode::block_size(), Botan::CT::Mask< T >::is_equal(), Botan::TLS::TLS_CBC_HMAC_AEAD_Mode::mac(), Botan::TLS::TLS_CBC_HMAC_AEAD_Mode::name(), Botan::TLS::TLS_CBC_HMAC_AEAD_Mode::tag_size(), Botan::unlock(), and Botan::Buffered_Computation::update(). Processes msg in place and returns bytes written. Normally this will be either msg_len (indicating the entire message was processed) or for certain AEAD modes zero (indicating that the mode requires the entire message be processed in one pass). Definition at line 114 of file tls_cbc.cpp. Definition at line 180 of file cipher_mode.h. Referenced by Botan::AEAD_Mode::create(), and Botan::Cipher_Mode::create(). Definition at line 190 of file cipher_mode.cpp. Definition at line 59 of file tls_cbc.cpp. Set associated data that is not included in the ciphertext but that should be authenticated. Must be called after set_key and before start. Definition at line 95 of file aead.h. Unless reset by another call, the associated data is kept between messages. Thus, if the AD does not change, calling once (after set_key) is the optimum. Definition at line 129 of file tls_cbc.cpp. Definition at line 80 of file aead.h. Definition at line 69 of file cipher_mode.h. 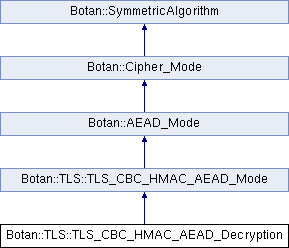 Referenced by botan_cipher_start(), Botan::TLS::check_tls_cbc_padding(), Botan::TLS::TLS_CBC_HMAC_AEAD_Encryption::set_associated_data(), and Botan::TLS::write_record(). Definition at line 79 of file cipher_mode.h. Definition at line 87 of file cipher_mode.h. Definition at line 39 of file tls_cbc.h. Referenced by Botan::TLS::TLS_CBC_HMAC_AEAD_Encryption::finish(), finish(), Botan::TLS::TLS_CBC_HMAC_AEAD_Encryption::output_length(), and output_length(). Process some data. Input must be in size update_granularity() uint8_t blocks. Definition at line 112 of file cipher_mode.h. Referenced by botan_cipher_update(), Botan::XTS_Encryption::finish(), Botan::ChaCha20Poly1305_Encryption::finish(), Botan::CFB_Encryption::finish(), Botan::CBC_Encryption::finish(), Botan::EAX_Encryption::finish(), Botan::XTS_Decryption::finish(), Botan::CFB_Decryption::finish(), Botan::CTS_Encryption::finish(), Botan::CBC_Decryption::finish(), Botan::TLS::TLS_CBC_HMAC_AEAD_Encryption::finish(), Botan::CTS_Decryption::finish(), and finish(). Definition at line 71 of file tls_cbc.cpp. Definition at line 61 of file tls_cbc.h. Referenced by Botan::TLS::TLS_CBC_HMAC_AEAD_Encryption::finish(), finish(), Botan::TLS::TLS_CBC_HMAC_AEAD_Encryption::output_length(), and Botan::TLS::TLS_CBC_HMAC_AEAD_Encryption::set_associated_data(). Definition at line 76 of file tls_cbc.cpp. Referenced by Botan::Salsa20::cipher(), Botan::CTR_BE::cipher(), Botan::RC4::cipher(), Botan::SHAKE_128_Cipher::cipher(), Botan::ChaCha::cipher(), Botan::Poly1305::clear(), Botan::Blowfish::decrypt_n(), Botan::CAST_128::decrypt_n(), Botan::IDEA::decrypt_n(), Botan::SM4::decrypt_n(), Botan::DES::decrypt_n(), Botan::Twofish::decrypt_n(), Botan::KASUMI::decrypt_n(), Botan::XTEA::decrypt_n(), Botan::MISTY1::decrypt_n(), Botan::DESX::decrypt_n(), Botan::Noekeon::decrypt_n(), Botan::SEED::decrypt_n(), Botan::CAST_256::decrypt_n(), Botan::SHACAL2::decrypt_n(), Botan::Threefish_512::decrypt_n(), Botan::Serpent::decrypt_n(), Botan::Lion::decrypt_n(), Botan::TripleDES::decrypt_n(), Botan::GOST_28147_89::decrypt_n(), Botan::DESX::encrypt_n(), Botan::IDEA::encrypt_n(), Botan::CAST_128::encrypt_n(), Botan::SEED::encrypt_n(), Botan::DES::encrypt_n(), Botan::Twofish::encrypt_n(), Botan::SHACAL2::encrypt_n(), Botan::SM4::encrypt_n(), Botan::Blowfish::encrypt_n(), Botan::KASUMI::encrypt_n(), Botan::Noekeon::encrypt_n(), Botan::XTEA::encrypt_n(), Botan::CAST_256::encrypt_n(), Botan::MISTY1::encrypt_n(), Botan::Threefish_512::encrypt_n(), Botan::Serpent::encrypt_n(), Botan::Lion::encrypt_n(), Botan::TripleDES::encrypt_n(), Botan::GOST_28147_89::encrypt_n(), Botan::OCB_Encryption::finish(), Botan::OCB_Decryption::finish(), Botan::GHASH::ghash_update(), Botan::CFB_Encryption::process(), Botan::CFB_Decryption::process(), Botan::Salsa20::seek(), Botan::CTR_BE::seek(), Botan::ChaCha::seek(), Botan::OCB_Mode::set_associated_data(), Botan::Salsa20::set_iv(), Botan::ChaCha::set_iv(), Botan::GHASH::update(), Botan::GHASH::update_associated_data(), Botan::CFB_Mode::valid_nonce_length(), and Botan::ChaCha::write_keystream().